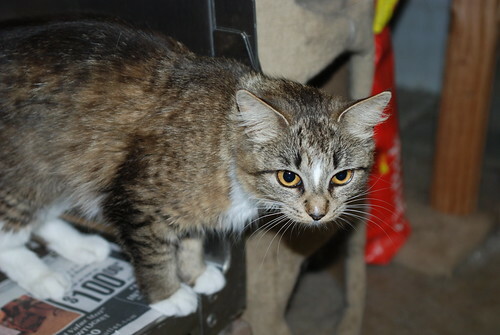 Hanna – Adopt me at North Attleboro Animal Shelter, originally uploaded by BenSpark. Hanna is an awesome girl. She is about 8 months and has a great personality! I met Hanna at the North Attleboro Animal Shelter and she hadn’t been there that long. She was scared and she needs a home. She is a very pretty girl, I hope she finds a home soon. I hope that she finds a home as well. She’s so cute, I hope she finds a loving home real soon. RemBeatZ’s last blog post..My God itâ€™s been a busy week so far! With her personality she should win some hearts soon. I think that is one of the best Cat eye shots I’ve ever done. Oh my goodness, she looks so much like Mandy at the local shelter here! Sometime, look at the photo of Mandy in my sidebar. They could be sisters! I don’t know why, but Mandy has been at the shelter for a few months now. She has that sort of long, extra-soft fur, too. Daisy the Curly Cat’s last blog post..Wordless Wednesday: Cat Burglar! They could be sisters. I just went and looked, Mandy is so cute and so is Hanna. I don’t know why either of them would still be in the shelter. They should be in forever homes. Aww, Hanna looks very sweet. We hope she gets a home soon. I think that she will have a home soon, at least I hope so.